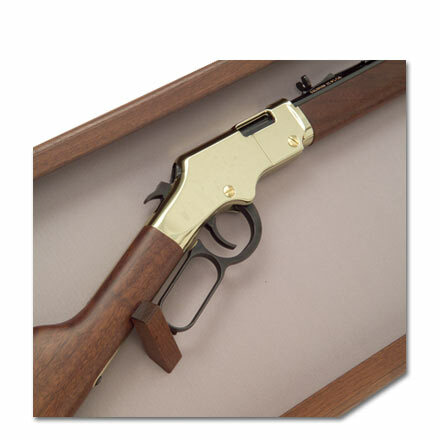 BSA Rifle Case | Custom wood specialities. Made in the USA. Companies with longstanding reputations have always asked Pocumtuck to cost-effectively create commemortive displays for their products. It's because Pocumtuck is a name they can trust with their reputations. 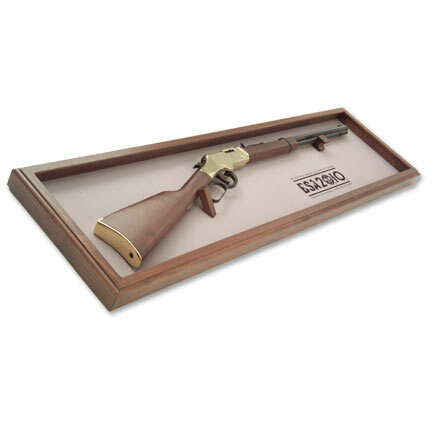 Here, Pocumtuck produced this wall display for a Boy Scouts of America commemorative rifle, made by a well-regarded rifle manufacturer. The walnut frame closely matches the rifle barrel stock, and the back panel is acrylic velvet, hot stamped with custom logo. Of interesting note, the wood blocks designed to hold the rifle in place thoughtfully spin in order to accommodate a range of different rifle models. Made in the USA.